And if you’re a gamer and haven’t voted in the New Next Gen BOTpoll yet, do so! The Playstation 4’s the big winner so far but the surprise for me is the Wii U coming in 2nd at the moment, either due to y’all being Nintendo fans or as a slap to the XBOX One. Either way, check it out here. yeah, that beastie’s gonna need some Bactine at the very least, flame_fingers. okay, it might need some Bactine and several stitches. best not to think about such things, Jason. yeah, that mouse-critter can’t be happy about that, dj. and, yes! you almost got the Shades. 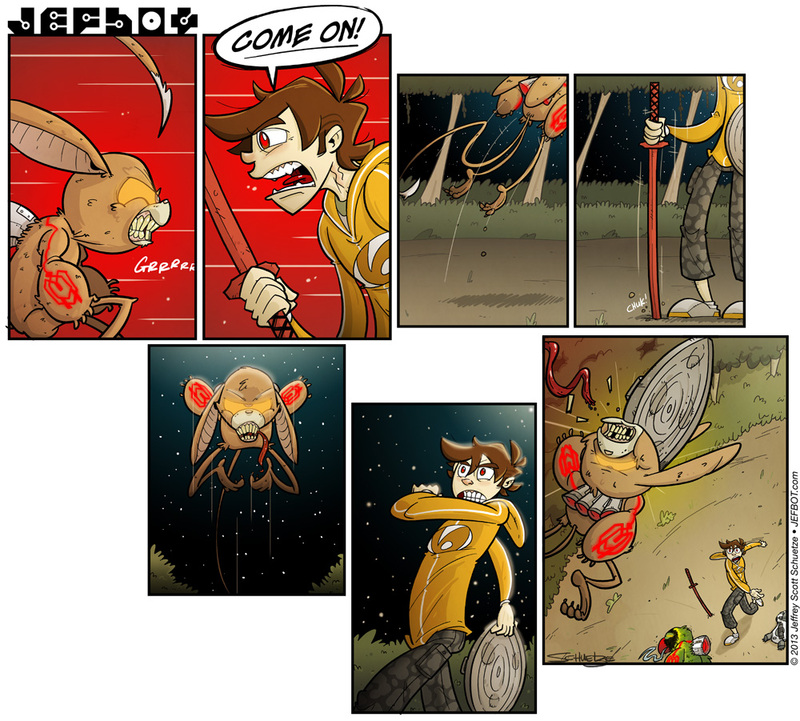 strip went up late due to me deciding to add a couple panels last-minute. never a good decision for getting the strip out on time but usually a good decision for the strip overall. I literally heard the thing say “OWIE!” when I saw the last panel. let’s hope the “aliens” and other beasties don’t want vengeance, theBean! ooo i love that JB got his steve rogers on. except bot’s still in scrawny-mode and hasn’t gotten the super-serum, yet, midnightarcher5! heheh. maybe a little badassery, JGT. flying saucer attack! surface-to-air garbage lid? and yeah, the lure of Youtube videos is strong, DAS. Someone took that “do or do not” advice to heart. there is no try, Oz! Might have to start calling him Captain Jefbot now, that was a move right out of the Captain America playbook! aw, man – now you have that sad piano music in my head and the image of bot hitchhiking home, JOE! and, yeah – bot’s got a little Hulk in him; you wouldn’t like to see him angry. and happy to surprise you with bot’s garbage can lid-throwing competence! I think it might be down for good now. Losing your tounge has gotta hurt! Oh sweet! My computer finally stopped bugging out and let me comment again! Now if you excuse me I’ll be commenting on all the comics I missed. BTW, the “you may also like” keeps showing me comics from the first year. It only reminds me of how much your drawing has improved over the years. It’s gone from a style that I’ll admit I didn’t really like (it looked like every lacked shouldres) to a very cool looking comic. When I see how greatly the drawing style has improved on this and other webcomics, it gives me hope that I’ll improve my drawing ability as well as solve my technical computer issues with my own comic strip. Perhaps I’ll eventually actually be able to crank out one comic a week (my short term goal) and then two a week. that’s how i started out, Rainey – once a week, then twice, then 3x a week. and storyboarding absolutely helps – especially on comics where you have action happening. and, yep, the more you draw the better you get. i’m curious to see where i’ll be in another few years! draw, draw, draw! glad to have you back, GB! and thanks for the kudos on my artwork. i think my old stuff is proof positive that if you keep working at something, you’ll get better at it. i just wanna re-draw all those old strips! yeah, unless the mouse creature can regenerate tongues, it probably won’t be bothering bot and Mu for the time being, GardeBlaze. Well somebody saw Captain America. Nice shot Bot… lets just hope that severed tongue doesn’t prove fatal. Don’t mess with the red-eyed ‘bot… you can’t handle the red-eyed ‘bot! indeed, Insectoid. red-eyed bot SMASH! Is he going to go green eyed to fix Musashi? Maybe the arm connections can work with his scarf neck connection. good theory, bj42 – let’s hope bot can get the “red eyes” under control or he’s not gonna be any help to anybody. bot needs to follow it up with an Uppercut Fist, G.L. Sytnos! Oh snap! He made it bite it’s tongue off and broke some of it’s teeth. If that thing isn’t dead/unconscious it is going to be really pissed off. ooh, bot will feel really bad if it’s dead, Fijiman. well, once his “rage” wears off. Behold: The Rebirth of Scrawn ! now he just needs to upgrade to Super Scrawn, Graypatch! Anger is good for getting the adrenaline pumping. I think that was just what Jefbot needed to take care of the evil rodent thingy. Go Bot! Hopefully the bird thingy is going to be all green/nice now and even more importantly, hopefully Mu is ok and will be waking up soon! true that, Shanna – now bot just needs to let the anger and the adrenaline go before he goes too far! (if he hasn’t already.) as for the bird thingy and Mu – we’ll find out sooOoon. this is my captain America impression. *wonk thud* well that was a knock out impersonation. bravo, drakeye! your impression was impressive. Brains beats brawns every time. Ok, now seriously, how is it that Bot kept a cool head when he is so obviously out of his happy place? yep, i’ll take brains over brawn (almost) every time, Maryz! as for bot keeping a cool head – the answer is, his head’s not that cool! he might have been able to toss that garbage lid accurately, but he’s on the verge of going full-on RED RAGE! he’ll need to pull it back before he goes to the dark place. With all of my skills as a knife/star thrower, I could never have managed an upward, long distance and accurate shot with a trash can lid like that! bot’s rage gives him strength and accuracy he wouldn’t have had in his “normal” state, Rainey! that and some luck helped him hit that shot. I hope Mousie is smart enough to stay down, before there aren’t enough pieces to bring back from the dark side. i don’t think Mousie has any choice in the matter at this point, Sarah W! well, let’s hope not.